The Holt Phillips website is up and running! 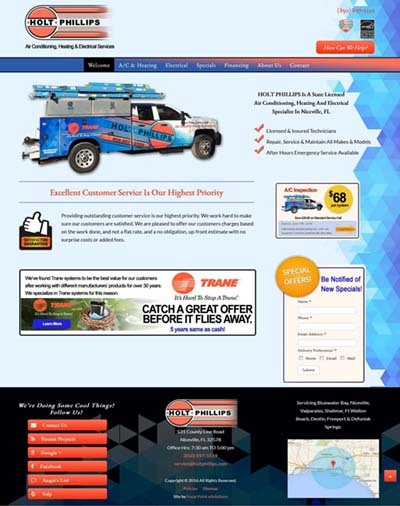 Please take a look at our HVAC and Electrical Services. We’ll be posting information to keep you abreast of the newest air conditioning and heating technology as well new specials being offered to help you save money. Thanks to Diane Minks of Focal Point eSolutions for working with us on this project. We look forward to continuing our relationship with Diane as we expand the website and grow our company. If we can be of help to you in the meantime, please give us a call at (850) 897-5559.